Long known as a popular vacation destination for the world’s elite, Palm Beach signifies all that can be great about the world. Combining seemingly endless recreation and leisure opportunities with world-class wildlife viewing in a gorgeous environment, Palm Beach fills the senses and leaves little to the imagination. While many visitors are drawn for the culinary variety and historical culture, the beaches have remained the highlight of the island for over a hundred years. This long and narrow tropical island retreat boasts miles and miles of open beach that play host to numerous water-based activities. With daring and modern new tourists hitting the beaches each day, the typical stroll on the beach just doesn't cut it anymore. 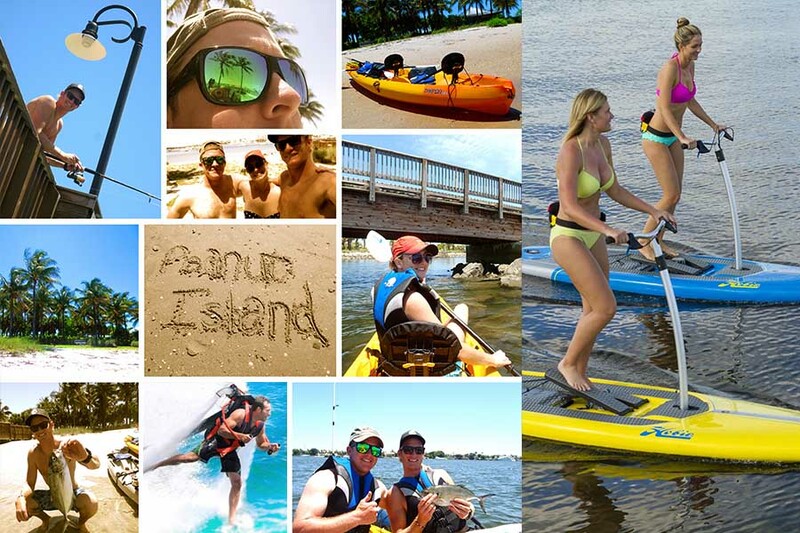 These visitors are constantly looking to challenge themselves and those around them by finding and creating unique things to do in Palm Beach. By challenging what is and creating what could be, these patrons find themselves on the very cutting edge of cool. There are a lot of unique and fun ways to spend a day in Palm Beach and, hopefully, one of our ideas may just inspire your next adventure! While it may not be entirely new or unique, any adventure parasailing will surely lead to a one of a kind story. Suspended below a parachute glider of sorts, the “para-sailor” is pulled rapidly behind a large speedboat. As air moves below the chute, the glider is forced upwards gradually. Offering stunning views, a bit of therapy for those afraid of heights, and an exhilarating adventure you'll not soon forget, parasailing is one of the best ways to make the most of a trip to Palm Beach. If you've ever wanted to fly around the world with a rocket strapped to your back, a Zapata may be just the thing you've been waiting for. Utilizing a steady stream of high-pressure water, the jetpack forces you upward and away from the surface for a realistic flight experience. Imagine a jet ski combined with a helicopter and a fire hose. The packs weigh around 30 pounds and are powered by an attached hose that forces water downward at a high rate of speed. Not for the faint of heart nor the weak-willed, the Zapata rewards the daring with a story of a lifetime. Nothing can be more relaxing and eye-opening than a peaceful drive through historical neighborhoods and pristine communities. Combine this relaxing experience with a drive right into the water in these amphibious duck boats. Is it a bus? Is it a boat? We may never know! But we do know the professionals at Diva Duck put on an amazing show and an even better cruise. With over an hour of musical and historical entertainment, the Diva Duck Crew is sure to make a big splash for your family. When it comes to water sports in Palm Beach, visit Nautical Ventures to see our wide variety of equipment for rent and sale, including the Hobie Mirage Eclipse board. Our easy to find location makes visiting the store a breeze. We are sure you’ll find water equipment fit for the entire family. Browse our huge selection of watercraft to coordinate your next trip today!